Contains: Sodium Carbonate, Sodium Silicate, Sodium Citrate, Lauryl Glucoside, Sodium Lauryl Glucose Carboxylate, Sodium Gluconate, Optical Brightener (UV Absorber), Sodium Polyacrylate, Carboxymethyl Cellulose, Soapwort Extract, Mint Balm Extract, Essential oil based fragrance. A high performance, phosphate-free, plant and mineral based laundry powder that delivers exceptional economy and performance. Award-winning formula - Our unique phosphate replacement technology has created new dimensions in quality and effectiveness. Boosted with plant-derived actives to assist in stain removal, preventing soil re-deposition and rinsing. Can be used in top or front loading machines - low foaming formula ensures suitability for all machine types. Ideal for hot or cold washing in hard or soft water. 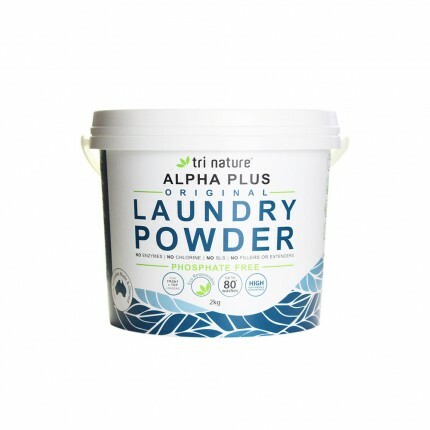 Ultra-concentrated formula delivers exceptional economy and reduces landfill potential - up to 80 washes per 2kg bag/bucket (based on 1 x 25g scoop as directed on the label). Gentle on fabrics, but tough on grease and grime - This gentle technology assists in maintaining the condition of your garment without stripping or drying the fabrics. Phosphate-free formula reduces algal blooms and marine toxicity. We recommend to descale your washing machine prior to use with Maxim Machine Descaler - Click here to find out more.